Encircled with pavé-set dazzling diamonds with a vivid royal blue sapphire gracing the center, this impressive ring set in rose gold 18k (750) is the example of fine artistry. The elusive designing of the ring with round brilliant diamonds renders this design truly stunning. The vivid shade of blue speaks for itself. Every aspect of cut, clarity and tone of the engagement ring has been taken care of while designing customised ring. This timeless piece of craft is something you rarely come across these days. Finding a combination as resplendent as this is like finding a treasure worth cherishing for a lifetime! 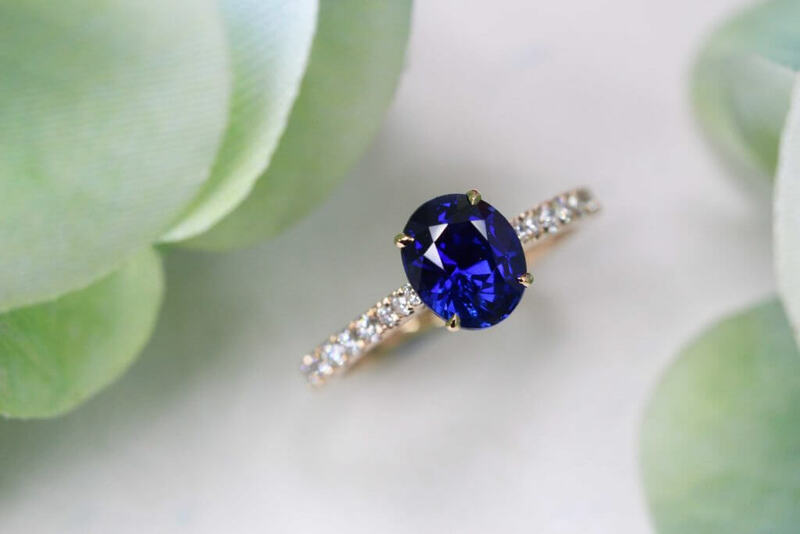 The perfectly matched amalgamation of deeply hued sapphire amidst the diamonds makes this design exclusively unique in appearance and also fashion forward. Planning to propose your beloved? Go ahead and take her breath away with this shimmering piece of craft. This delicately handcrafted ring can do more than you can ever imagine it to do. Emanating radiance from every angle, this alluring engagement ring can convey your deepest emotions for your beloved that you ever can do with words. This eternity ring with its perfectly matched precious gemstone and diamonds signifies a love that lasts forever. Featuring a modern timeless look, this blue sapphire ring has been designed to make onlookers swoon over its enthralling designing.